Film and video makers have played an important role in international protest movements, by documenting acts of resistance and sometimes becoming an integral part of the protests themselves. This month's events in Iran, revealed to the world incrementally as anonymously made cellphone videos posted to sites like Youtube, have reminded us all over again of the crucial impact of the moving image in protest movements. In conjunction with the Museum of Design Atlanta’s exhibition The Graphic Imperative, Film Love presents an evening of rare films and videos on historic protest actions. Most of the selections come from private collections or archives, and are not available on commercial video. Filmed from Atlanta to Prague to Tehran, and New York City’s Washington Square Park to Singapore’s Speaker’s Corner, these documents of protest were made by photographers, activists, DIY videomakers – and sometimes the police. The subjects of the protests range from AIDS and Communist repression to freedom of speech and the Vietnam War, yet within these powerful documents of life-and-death issues, agitation and occasional brutality, are glimpses of humanity and even humor. 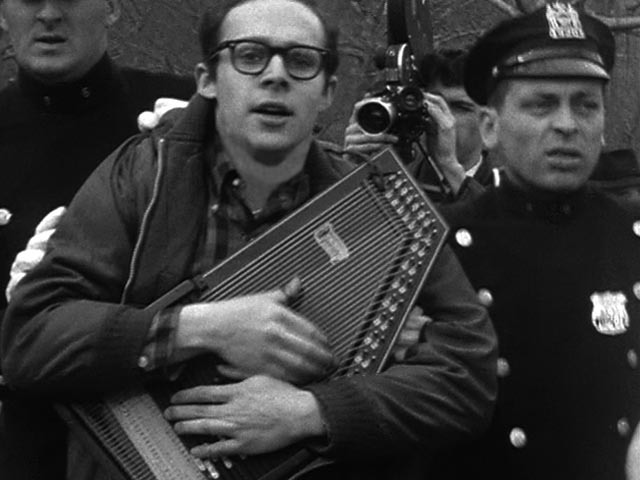 Dan Drasin’s recently restored 1961 film Sunday documents New York City’s ban on music in Greenwich Village’s Washington Square Park. The unexpectedly rough clash between a group of folksingers and the police, captured on the fly by the teenaged filmmaker, was a harbinger of the decade’s subsequent turmoil. Over 800,000 Czech citizens defied authorities to attend the January 1969 funeral of Jan Palach, a student who set himself on fire to protest the Soviet invasion of the country. A powerful portrait of individual and communal grief made by a prominent figure of the Czech New Wave, Jan 69 records the funeral procession in Prague. Both formally daring and emotionally moving, James Wentzy’s The Ashes Action is a neglected masterpiece of the prolific AIDS activist video movement. It documents a typically controversial ACT UP protest in which marchers outflanked police and reached the White House lawn, where they scattered the ashes of loved ones who had died of AIDS. Made in 1990 Atlanta as a side project during a major ACT UP protest, Marta: Portrait of a Teen Activist is a comedic video about an overachieving, politically correct activist – a rare example of a satire on protesters produced from within the movement. Marta is accompanied by VHS footage made at the same ACT UP action at the Centers for Disease Control in Atlanta. Featuring a handful of unarmed protesters against a mountain of police, Martyn See’s Speakers Cornered shows the almost farcical lengths to which authorities went to prevent a seven-person march in 2006 Singapore. The police can neither arrest the protesters, nor let them proceed, creating a stalemate. The resulting images of protesters surrounded by a human wall of police and unable to move are a classic glimpse into the politics of the absurd. Circulated worldwide via Youtube long before it could be screened in its country of origin, Speakers Cornered is an example of twenty-first century tactics in protest and media.